Planning a wedding is a military operation. There is so much to think about and so many details that must work in harmony for the big day to run smoothly. From the moment The Question is popped and the engagement ring is presented, a couple must go into Wedding Planning Mode, especially if they are aiming to get hitched within 2 years of the proposal. But, where on Earth do you begin? Lists upon lists is a start, but getting those lists to translate into a successful and joyous wedding day is no mean feat. When planning a wedding, one of the very first things you should decide on is who you want to share your special day with. Your guest list will determine the size of your wedding and the overall cost, so if you have a small budget you may choose to have an intimate wedding with only your nearest and dearest. Nowadays, weddings are very expensive. According to The Australian Securities and Investments Commission’s MoneySmart, the average Australian wedding in 2012 totaled around $36,000, but this figure has since risen significantly. Therefore, more and more couples are veering down a less traditional road and choosing to have large engagement parties and smaller weddings in an attempt to save money. Having a smaller scale wedding also means that there is more room to tailor the wedding how you like it. For example, if your wedding guest list is really intimate, you may then have the opportunity to have a destination wedding, and perhaps even cover your loved ones’ travel and accommodation costs. Or, you could choose to have a small wedding ceremony and a larger wedding reception. But bear in mind that the wedding reception is marginally more expensive than the ceremony. When it comes to budgeting for your wedding day, it’s important to note that your venue will be your largest expense by far. Expect to spend around 45% of your budget on the venue (noting that ‘Venue’ includes entertainment as well as food and drink), so it’s important to do your research and ask about special wedding packages. It is common to hire two separate venues for your wedding day – one being for the wedding ceremony, and one being for the reception. There are many types of venues you can choose from, dependent on budget, location, space, logistics, etc. A lot of churches, hotels, manor houses, leisure centers, town halls, colleges, and universities will have a wedding license and plenty of amenities to cater to your big day. Large hotels and manor houses may have designated rooms available to you at varying costs, so it’s worth discussing building access options, especially if you are budget conscious. What’s more, a lot of venues that regularly hold wedding receptions will offer in-house catering and access to their in-house AV systems as part of a package, which will be significantly cheaper than bringing in external services. Another way to save money is to pick a venue close to home, as this will bring down the cost of travel and accommodation. It’s important to note that wedding venues book up far in advance – sometimes up to a year in advance – so you should begin your venue research as soon as you have a date. Music is one of the most important features to any wedding day; its significance is monumental. If you think back to all the weddings you have attended in your lifetime, the most memorable ones will no doubt be those where the music has got you up on your feet dancing until the small hours of the morning. With the right music, both you and your guests will have the time of your life. For your wedding reception, you have the choice between hiring a DJ or a live band. DJs are often the cheaper option, but a live band can create a special and intimate atmosphere which is ideal for the truly special moments like the First Dance. A top DJ will have thousands of songs in their repertoire, meaning you and your guests can request your favorite songs all night long. But, contrary to common belief, an experienced wedding reception band can cover your favorite songs spectacularly, and switch between genres with ease. You can even tailor a live band to suit your style and budget. In an ideal scenario, you would have a live band during the wedding ceremony and the first half of the reception, and then a DJ to take the party into the night and get everyone on the dancefloor. Another wedding must-have that should be high on your priority list is to purchase wedding attire. This, of course, includes the crème de la crème of the occasion – the dress. It’s recommended for a bride to buy her wedding dress 6 months before her big day so that there is plenty of time for custom tailoring and readjustment. 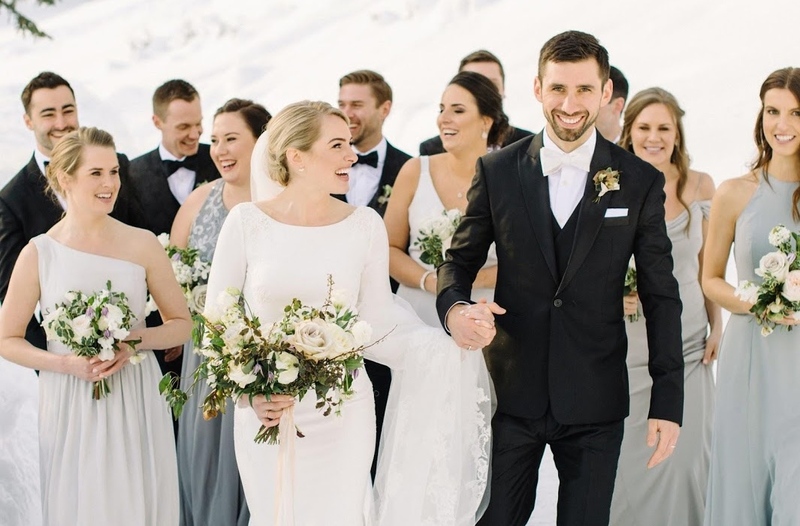 Aside from the wedding dress, another wedding attire you must think about is the grooms’ suit, dresses, shoes and accessories for the bridal party, suits for the groomsmen and outfits for the page boy(s) and flower girl(s). Food and drink is another important component to arrange early on in the planning stages of a wedding. Most weddings are boozy affairs, and guests will expect to be fed and watered throughout the day. Talk to your chosen venue to discuss menu options and the cost of providing free alcohol on the night. It is common to offer guests a choice between red or white wine (as well as soft drinks) during dinner, and then harder drinks later in the evening. And if you want to save money, don’t offer a free bar – your guests will be happy to buy their own drinks as the night goes on, and you will avoid being landed with a hefty bar tab. Planning your big day is daunting because of its significance. However, if you have the key 5 components in place – guest list, venue, music, attire and food and drink – the rest of the planning will fall into place.